I have said it before and I will say it again, snow days are what dreams are made of. I do not know if snow days are exciting because they almost always come as a surprise or if it is because there is a free day thrown into typically busy schedules. I, like most college age students, welcome these days because they mean no work, no meetings, and no classes. Although I am very thankful for my now free schedule I am most excited to go adventure in the fresh snow that is falling outside of my window because I absolutely love it. Unlike some people that are annoyed by the snow when I hear of an impending storm I start planning my day complete with hot chocolate, watching day time TV, and of course sledding. Snow has always been something that has brought a smile to my face because it meant a break from the normal routine. Now instead of snow days canceling spelling tests and rescheduling parent teacher conferences they mean no class discussions and an excuse not to venture to the dining hall. 1. Homework: Wait, I know this does not look so fun at first glance and I just said snow days mean no class but hear me out. After you take your time waking up, sit down and bang out a quick homework assignment, it will take less than an hour if you pick correctly and actually focus. Then for the rest of the day you can use the fact that you were productive as an excuse to goof off and be lazy. 2: Netflix: I mean, college students do this any day but on snow days there is nothing to feel guilty about. Instead of watching something that you’ve seen before I recommend watching something completely random and continuing with your normal binge watches during the week. I watched one of my favorite movies, Populaire, during a snow day last year just because I liked the artwork (SPOILER: This movie is in French). 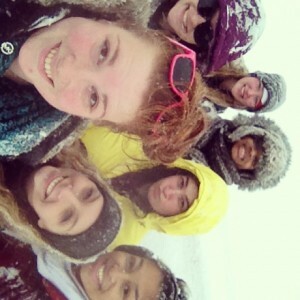 My friends and I sledding during a snow day last year. 3: Go Outside: Even if you do not like snow you can not argue about the fact that it makes everything beautiful. Snow makes everything look kind of magical and perfect so it is the perfect time to go outside and explore. I welcome snow days because it means I can get my friends to go sledding or partake in cliche snow activities like make snowmen or snow angels. Plus, who doesn’t like snowball fights? 4: Hang out with friends: In college everyone is SO busy and people operate on different schedules. The great thing about snow days is that everything gets cancelled for everyone (except your friends that have stuff to do off of campus). Take advantage of that and invite your crew over to hang out, build blanket forts, or play some video games. Acting like a kid with friends is, in my opinion, one of the greatest things about having them.